Whaler 564 is a recently remodeled studio condominium with a fabulous ocean view, located on the popular courtyard side of Tower II on the 5th floor. 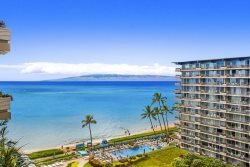 Enjoy afternoon shade on your lanai with views of the West Maui Mountains to your right and Kaanapali Beach and the neighbor island of Molokai to your left. Outstanding view of Black Rock! Completely upgraded with a new kitchen, bathroom, flooring and furnishings, King bed and Queen sofa sleeper, plus a washer and dryer in the unit. 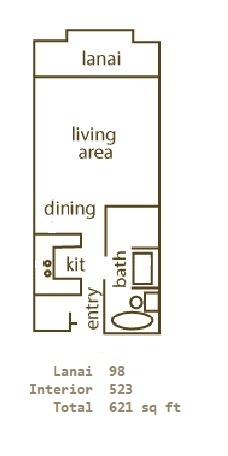 All units feature full kitchens, full baths, central air conditioning, free Wi-Fi, and a large private lanai (balcony). You have the assurance of having an on island manager with over 30 years of experience to make sure you have the very best vacation experience! King Size bed was super comfortable and furniture was right out of Tommy Bahama. Great new refrigerator and stacked washer & dryer were awesome! Beautiful view of Black Rock and the pool is heated. We had a delightful time staying in this unit and would highly recommend your stay here. Property was great— close to the village, nice grounds and pool, easy access to the beach. The newly remodeled condo was very nice and comfortable (especially the bed!). Staff was very nice and helpful. We were lucky enough to spend a week in this unit. It has been beautifully decorated. Since we like to cook, we were particularly pleased with how well equipped the kitchen was. Everything in the room was first rate. The only thing softer than the luxurious bed was the sand on the beach! The beach itself is wide, the waves were gentle and the water was just the right temperature. The condo's patio was a great place to unwind after a "grueling" day downstairs at the beach - or for breakfast! A huge shout out to the Whaler Community - the staff was very friendly and helpful - and they maintained the grounds and facilities meticulously. There were plenty of places to sit by the pool, and we also enjoyed the hot tub. And a even bigger thank you to the condo owners. We were there along with Hurricane Lane and had to change plans for the second half of our Maui trip. They worked with us through the uncertainty and even made sure we had a place to go if we couldn't find one before their next guests arrived.